I could not ask for a better preschool for my daughter Ela! She attended Montessori International Preschool in Frederiksberg for 2.5 wonderful years. Day after day, we watched her expand her horizons whilst her true self and strengths have been nurtured in the loving, caring and gifted hands of the teachers and staff in Frederiksberg. The preschool has equipped her for the life ahead of her and we genuinely hope she will always remember and treasure her Montessori upbringing. I hope your kids will have a chance to be a part of this amazing learning journey. My daughter Wandou was very fortunate to be a student in Montessori Preschool. She enjoyed the school environment and the interactions with teachers and schoolmates. All teachers were very friendly and skillful in teaching kids. In particular, Nolwenn was very kind and helpful to my family members and my daughter when they had communication challenges. My wife and I were extremely impressed about the way that my daughter was being taught in the school. She often surprised my family members and friends by her language capabilities and knowledge learned in the school. Montessori Preschool is definitely one of the best preschools in Copenhagen. I have recommended it to many of my friends and colleagues in the past few years. I wish my second daughter has the opportunity to join Montessori Preschool as well when she turns 3 years old. Our oldest son had a fabulous time at the Montessori International Preschool and benefited enormously from his almost two years there. The Montessori method supported and accelerated his intellectual, social and emotional development. The teachers paid attention to every individual child and managed the group dynamics very well. He left well prepared for starting school and with a group of close friends around him. My daughter Lucille had the great chance to study during 3 amazing years at the Valby Montessori International Preschool. 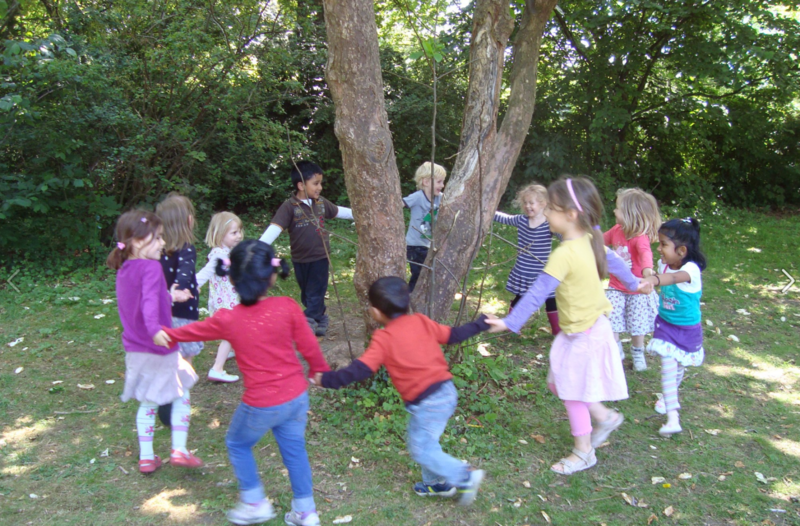 She loved the environment, the staff and the Montessori Method… and so did I! The staff is very caring about the children’s needs and abilities and my daughter grew a lot, became empowered and was so happy going to school every day, helping the others and learning new stuff. Her English improved fast and she learned many things, from songs to the transformation of a caterpillar into a butterfly. The communication with the families was regular and Isabelle and Christine are very dedicated and easy to talk to. I would definitely recommend this school for any family who wishes to give his little ones self confidence, autonomy and freedom in a safe and international environment. My son attended the Preschool in Valby in 2011-2012. Isabelle and the Team are doing their jobs professionally and with heart. Kids are growing in a positive atmosphere, spending their time together and helping each other to develop their skills. Communication with parents is done on a regular basis and this helps parents to focus on the areas of development of their children. I would recommend the Preschool to anyone seeking a learning environment for their kids both safe and comfortable. I felt the place was so much fun for kids. But every toy, every activity had learning carefully hidden in it. My boys used to look forward for the monthly themes and projects around it. Even though it is more than 2 years we left Denmark, my boys still talk about the projects like solar system, butterfly and chicken life-cycles, they did there. All the teachers loved kids like mothers and kids felt it. They even took extra effort in teaching kids yoga, dance, happy birthday song in various languages. It all showed they really cared for kids. The preschool atmosphere is very kind and caring. They behave and care to all in same manner, no matter which race and ethnicity you belong. Weekly picture sharing was the best gift any parent could get from a school. We could see what all kids did in the school. It was so satisfying to see it then and now too like a memory. I wish very best for the school and teachers. I hope and wish you continue to shape childhood of many many more kids.